Groups will enjoy a special stay in this historic 14th century manor home in Chepstow, whether it be part of a tour or on a leisure break. St. Pierre Marriott Hotel & Country Club is surrounded by 400 acres of parkland in the beautiful Wye Valley. Stretch out in immaculately designed rooms, which offer pillowtop bedding, high-speed internet and a flat-screen TV, or book one of our suites for breathtaking country views. Additional hotel amenities include a heated indoor pool and a fully equipped gym, as well as a tranquil on-site spa. Perfect your swing on one of our two championship golf courses, which offer challenging play and wonderful views. And stop by our outstanding hotel restaurants for seasonal cuisine, a cocktail or a delicious Afternoon Tea. If you're planning an event in Chepstow, you can make use of our flexible venues, modern technology and delicious catering services. 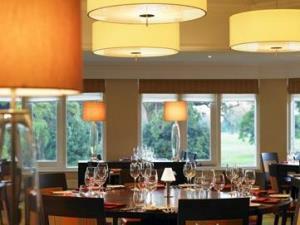 We're eagerly awaiting your arrival here in Wales at St. Pierre Marriott Hotel & Country Club. Please contact the hotel for special group rates.